What do three dogs and a cat have to say when a baby kookaburra is found in their yard? Buddha, the cat, starts by asking, “What the blooming tail is it, mate?” Hoover, one of the dogs, thought it looked like lunch. Ajax thought it was a toy. But Stelze, an aging Doberman, informed everyone it was a baby, and she planned to protect it in every way possible. 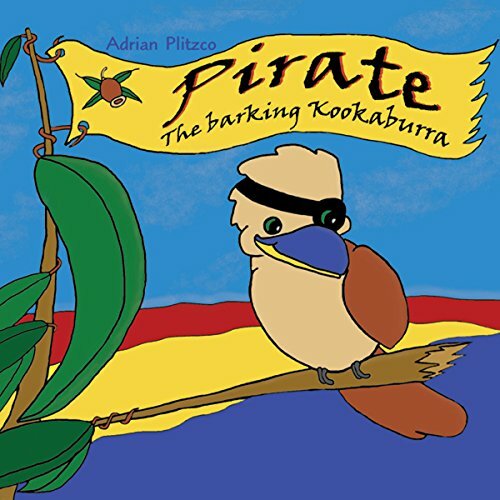 A young kookaburra named Pirate finds himself on an unfamiliar farm after a storm. Three dogs and a cat befriend Pirate, socalled because of a circle of black feathers around his left eye and a band of black feathers around his head. The local kookaburras think the young bird is a parrot in disguise because he can’t laugh. When the dogs teach Pirate to bark, a poisonous snake lurking in the tall grass is confused. Fullgrown kookaburras, easily identified by their raucous laughter, can kill snakes, but this little bird only barks. When a second storm strikes the farm, Pirate remembers where he lives and realizes that his parents must be terribly worried. The old dog Stelze attempts to lead him home, but the long journey through the tall grass wears her out. Pirate ventures out alone and barely escapes the snake, which bites Stelze as she tries to protect the bird. How Pirate and the kookaburras dispatch the snake and the farmer gets Stelze to a veterinarian just in time make an exciting conclusion. Pirate’s differences become his strengths, and he finds the courage within that comes only from a crisis. ,P>A very Australian audio book complete with sounds of the bush, big Australian accents (but easily understandable), and characters who say ‘bloody’. Sections of the story are punctuated leisurely by pleasant and cheery bushfolk music.For children ages 4 through 11.